We had a wonderful Easter weekend- it was full of Spring sunshine, Easter egg hunts, and family gatherings. But the best part was Sunday at 3:00. We live in a neighborhood full of young families- there are more strollers than cars, more baby bottles than beer bottles, and more schools than stores. It is a great place to raise our children, and that’s been reaffirmed many times since we bought our house nearly two years ago. What I didn’t count on though, was the seemingly simple moments that make the largest impact and create the biggest impressions on my children. As we pulled both kids in the wagon around the neighborhood on Saturday morning, we noticed hand-made signs taped to the lightposts, announcing a ‘Free Bike Wash’, to take place on Sunday afternoon. The childish penmanship was neat and carefully written, and promised to ‘make your bike shine’. My 4-year-old son’s face lit up immediately. His curiosity and wonder was all-encompassing. Imagine: a neighborhood event, just for kids, organized by other kids. For him, it seemed too good to be true. We walked over to the address listed on the signs, and talked to the 9-year-old boy who lives across the street from us. My shy little guy proudly announced that he would be bringing his bike to the Bike Wash at 3:00 tomorrow. As we went inside, our doorbell rang. It was the bike-washers bringing an appointment reminder note for Drew. Sunday 3:00. 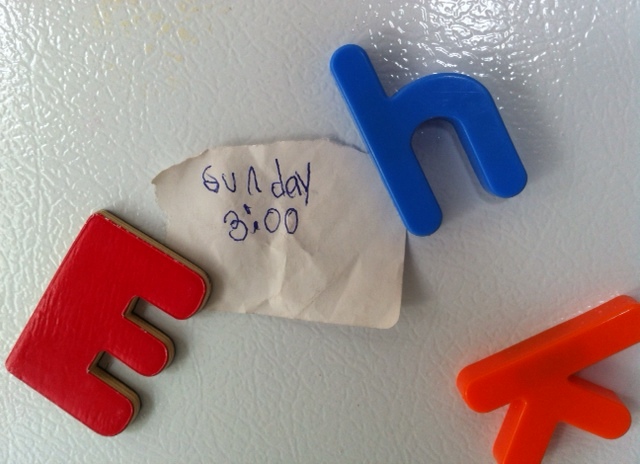 We hung the reminder on our fridge door. Then we hosted Easter dinner. We went to church. We did all sorts of wonderful family things while Sunday at 3:00 hung in the distance. And when Sunday at 3:00 finally rolled around, as slowly as time passes in a 4-year-old’s world, it was raining. The Bike Wash went ahead anyways, and an impressionable little boy made new friends, felt a sense of community, learned the value of helping others, and had fun. All on Sunday at 3:00. This entry was posted in Opinion, Parenthood and tagged bike wash, children, neighborhood. Bookmark the permalink.